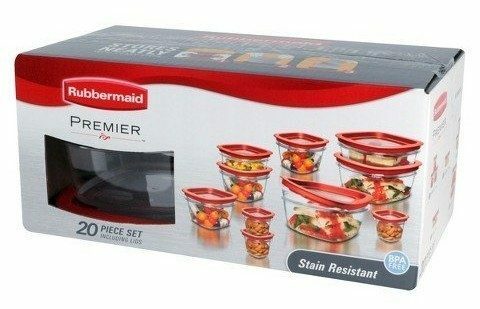 Rubbermaid 20-Piece Premier Food Storage Container Set Just $17.99! You are here: Home / Great Deals / Amazon Deals / Rubbermaid 20-Piece Premier Food Storage Container Set Just $17.99! Today Only! You can get the Rubbermaid 20-Piece Premier Food Storage Container Set for Just $17.99 from Amazon! Shipping is FREE on orders of $35+ or if you are a Prime member! Bases are made with Tritan plastic that resists stains and odors. Flex & Seal lids lock in freshness and are easy to seal & remove. With the easy-find lids system, lids snap to the bottom of the container and to each other. Containers stack smartly and fit efficiently side by side to save space. Microwave, dishwasher, and freezer safe. BPA-free. NSF Certified. Made in the USA. 1-year limited warranty.